A for sale sign at the current County Hall site in Morpeth, with part of the building in the background. A full council debate over the project to close County Hall in Morpeth and build a new headquarters in Ashington will take place, it has been claimed. Conservative group leader Peter Jackson says that although a motion earlier this year was blocked from appearing on an agenda, a similar one calling for a review before contracts are signed will be discussed at a meeting on December 7. However, the county council has said it will have to see the details of the motion first before making a final decision on whether the debate will take place and the Labour group has criticised Coun Jackson for continuing to pursue the matter. 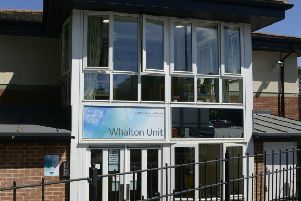 Labour says the relocation to smaller premises will save the council money in the long term, as it would be more expensive to refurbish or downsize the current premises, and it enables more staff to be deployed across the county’s main towns. Opposition groups believe it will be more expensive to move as the total cost is likely to be ‘much higher than the original £32million figure’. Coun Jackson said: “This will be the last chance for us to ask councillors to see sense on the project. Although the tender process may be completed, no contracts will have been signed. “The vast majority of residents I’ve spoken to think it’s a complete waste of money. Some of them are Ashington residents who believe this project is wrong for their town. Coun Grant Davey, county council and Labour group leader, said: “We want to get on and deliver jobs and council services closer to our communities in the market towns and Coun Jackson’s latest attempt to derail really does him no credit at all. “The proposed move of the council’s headquarters to Ashington has been fully considered by a number of committees, as well as being subject to review by independent external experts who have found that there are no issues with either value for money or with decision making on the issue.